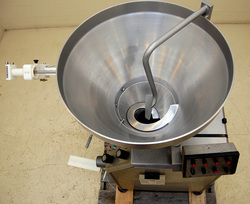 38 inch diameter by 29 inch deep conical infeed hopper, hinged and tilts down for easy cleaning. 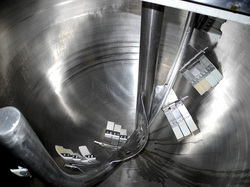 Positive agitate-and-feed spiral keeps product from bridging in the hopper and positively pushes the product from the hopper to the vane pump. 70.75 inch infeed height, 30.25 inch discharge height. Comes with (4) interchangable stainless steel discharge tubes in diameters of approximately: .571 inches, .770 inches, .971 inches, 1.19 inches. Includes an integral 20m3 vacuum pump that assures compact and air free product even with hard and low temperature raw material. Complete with operator touch screen control panel with safety / lock-out sensors. 6.5 HP asynchronous variable speed motor; --208 / 230v 3 phase electrical input. Food grade USDA sanitary stainless steel construction, specifically designed for fast and easy cleaning and sanitation. A versatile vane pump - filler suitable for many different types of product from meats, particulate products, pastes, butters, creams, and other difficult to handle and/or delicate products, with very gentle very positive product transport, under vacuum for minimal product oxidation. As of this writing, this rotary vane type continuous vacuum stuffer is in stock at Alard, in LIKE NEW condition, available for immediate shipment. 42 inch diameter by 34 inch deep hemisherical bottom stainless steel vessel with 3 inch diameter center bottom outlet (Threaded). Stainless steel steam jacket manufacturer tagged and hydrostatically pressure tested for 40 psi working pressure. Single motion scrape-surface agitation with stainless steel agitator support bridge. Complete with stainless steel top covers. A food grade stainless steel kettle on (3) painted steel support legs, currently set for an infeed height of 46.25 inches and a discharge height of 8 inches. The legs could be replaced with stainless steel and/or shortened or lengthened to change the working height of the kettle for nominal additional cost. As of this writing, this Groen kettle is IN stock at Alard, available for timely service and shipment. 6 INCH HYDRO TRANSPORT FOOD PROCESS PUMP with STAINLESS STEEL VORTEX TANK and 7.5 HP DRIVE. Cornell 6NHPP-F10K expanded volute (for gentle product handling) cast iron food pump mounted on a Commercial-built tubular stainless steel frame, with a 42 inch long by 30 inch wide by 20 inch deep tapered bottom infeed / vortex tank tank, with an 8 inch flanged infeed, 2 inch threaded bottom drain, and flexible coupling to the pump. On this same frame the pump is connected to a 5HP belt drive with pulley-type variable speed control. 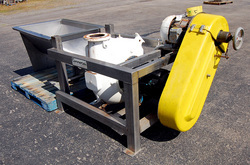 Per the manufacturer literature (pump curve available on request) capable of approximately 500 gallons per minute at 55 foot head with solids handling ability for product up to 4" diameter by 6" length. Cornell's patented expanded offset volute design feature makes for much gentler product handling. AS of this writing, this hydro food transfer pump is in stock in good condition, available for timely shipment. VACUUM STUFFER VEMAG ROBOT Model V500/ TYPE 128/90 with PORTIONER / LINKER. 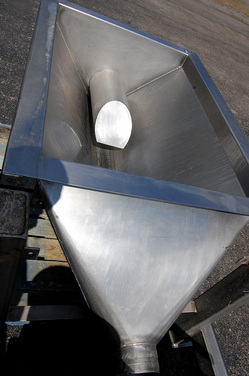 26.5 inch diameter by 24 inch deep conical infeed hopper, hinged and tilts down for easy cleaning; with fixed baffle to maximize product flow. Postive agitate-and-feed spiral keeps product from bridging in the hopper, and positively pushes the product from the hopper to the positive dislacement double screw / dual auger pump configuration, with self-contained vacuum system. A range of accessories can be attached to the discharge to handle a wide range of products and filling tasks. Complete with manufacturer control panel on swivel arm with analog operator controls, and twist linker/portioner mechanism. 61 inch infeed height, 40 inch discharge height. 208/230 volt 3 phase 20 amp electrical input. Food grade sanitary stainless steel construction, specifically designed for fast and easy cleaning and sanitation. 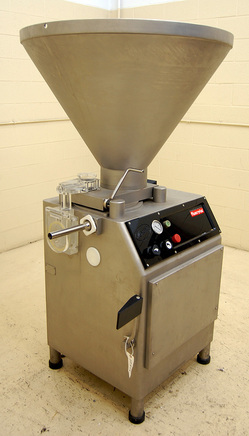 This filling machine is manufacturer rated up to 450 portions per minute, depending on product and fill size, with gentle product handling, and extremely weight-accurate portioning. 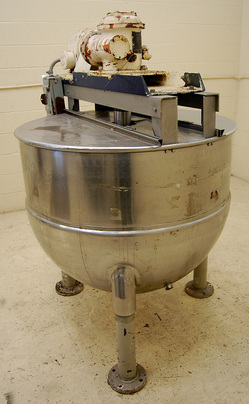 A very accurate and versatile pump-filler suitable for many different types of product from meats, particulate products, pastes, butters, creams, and other difficult to handle and/or delicate products, with very gentle very positive product transport, under vacuum for minimal product oxidation. 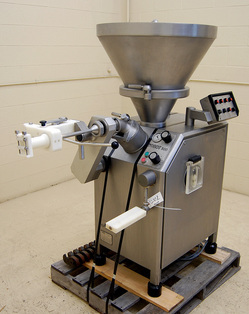 As of this writing this Reiser Vemag sausage stuffer is in stock at Alard, in very good operational condition, available for timely shipment.